JACKSON, Miss. (CNS) — Renovations at the rectory for the Cathedral of St. Peter the Apostle caused quite the buzz in downtown Jackson during the second week of March. The restoration crew had to call in a beekeeper to remove a 5-foot-tall hive from one of the columns on the rectory porch. The operation drew news crews and concern from bank employees next door but was completed smoothly and safely. Rectory staff and reporters even got to take home sections of honeycomb. Traci Avalon, office manager for the rectory, said she has known the bees had a hive in the column for a decade, but since they didn’t seem to bother anyone and she knows bees are endangered, she left them alone. When it came time to renovate, she included bee removal in the bid process. “I told them I did not want the bees destroyed. I know some beekeepers and I knew they can be moved,” she told the Mississippi Catholic, newspaper of the Diocese of Jackson. Durable Restoration, a sister company to Durable Slate, took on the project. The company worked on the cathedral renovation several years ago and has done a lot of work in churches. Jacob Lammers, a spokesman for Durable Restoration, said this is not the first time the company has worked with a beekeeper to remove a hive. While beekeeper Michael Everett from Magee led the effort, Durable Slate employees donned protective bee suits and did the heavy lifting. Workers drilled holes in the column and used a camera to precisely locate the hive. 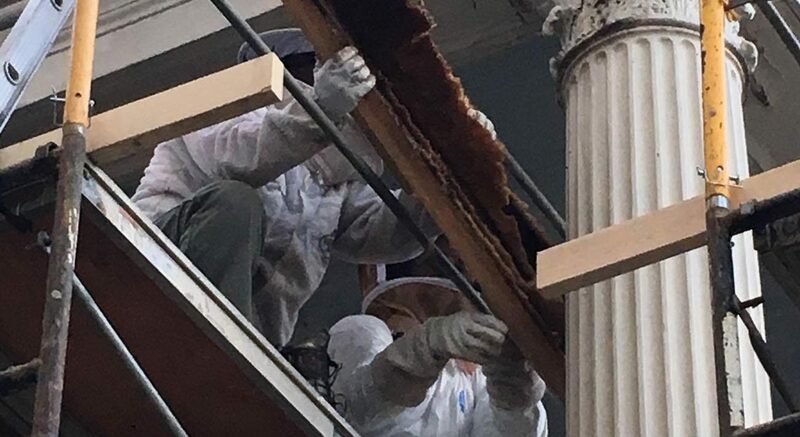 Then, they carefully cut the wood around the hive to remove a whole section from the column, bringing with it 10 years’ worth of honeycomb, honey and insects. “As bees build a nest, they continue to make it go down every year. They start at the top and as they have space they will go down. The column was about 20 inches inside and the bees have three-eighths of an inch crawl-space so they will suspend the combs and build from there,” Everett captured the queen bee and drew the workers out to her. The whole operation, started in the late afternoon, took about three hours. He guessed there was about 50 pounds of honey in this hive. “These were Italian bees, a three-banded Italian. They were yellow with little black rings,” Everett explained. He has been a beekeeper for 13 years. He used to work in construction so he uses his knowledge of how structures are built to find creative ways to remove bees. These days he raises his own queen bees and helps with the occasional hive removal. He said as long as the bees are moved more than one mile from their original location, they will not return to their old nest. The cathedral bees will have a new home at the Mississippi State University Agricultural Experiment Station in Crystal Springs where they will pollinate local crops and continue to make honey. Avalon said she will extract the honey from the comb she got and put it up for auction at the St. Peter Ministry Fair later this spring. Smith is editor of the Mississippi Catholic, newspaper of the Diocese of Jackson.